Troye Sivan Performs at G-A-Y, Meets ‘RuPaul’s Drag Race’ Star Valentina | Jacob Bixenman, Troye Sivan, Valentina | Just Jared Jr.
Troye Sivan caresses his boyfriend Jacob Bixenman for a portrait at G-A-Y night at Heaven Nightclub on Saturday night (March 2) in London, England. The 23-year-old singer and the model/photographer were joined by RuPaul’s Drag Race alum and Rent: Live star Valentina. “Family portrait,” he captioned a behind the scenes photo of the trio. He also shared another photo from the night with the caption, “I WANNA BE THAT G.A.WHYYYYYYYYYY❤️❤️❤️,” referencing Lady Gaga‘s song “GUY”. Troye performed four songs at the club, including “My My My”, “Bloom”, “1999″, and “I’m So Tired”. He is currently traveling around Europe on his Bloom Tour before he heads to other parts of the world. Check out a full list of dates at TroyeSivan.com! 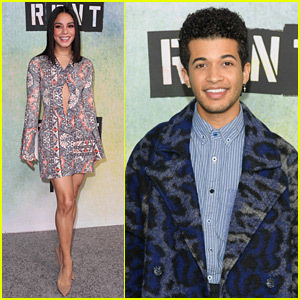 Vanessa Hudgens, Jordan Fisher & More Step Out for 'Rent Live' Press Day!